In large bowl, beat butter and sugar with electric mixer on medium speed until smooth. Beat in almond extract and eggs. With spoon, stir in flour, baking powder, 1/3 cup condensed milk, the whipping cream, milk and 1/2 cup of the almonds just until moistened. Divide batter evenly among muffin cups (3/4 full). Sprinkle remaining 1/4 cup almonds evenly over batter in cups. Bake 15 to 20 minutes or until light golden brown. Remove muffins from pan to cooling rack. Cool 10 minutes. Drizzle 1 teaspoon additional sweetened condensed milk over top of each muffin. Serve warm. 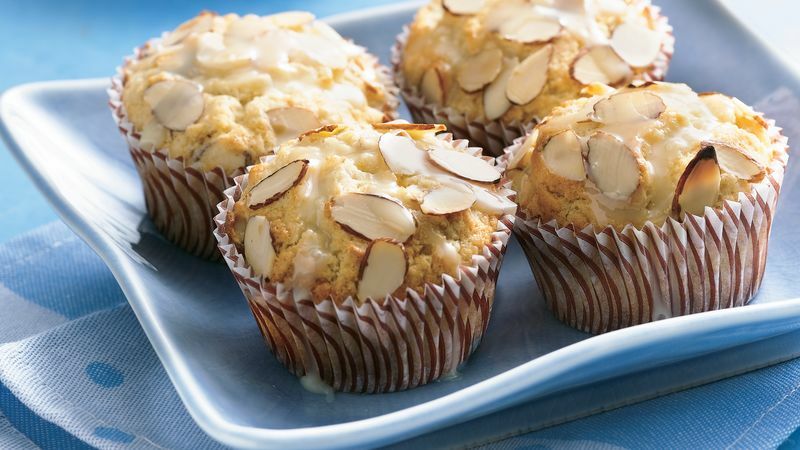 To avoid soggy muffins, take them out of the pan immediately upon removal from the oven.